There are 6.2 million uninsured students in the United States. AASA, The School Superintendents Association, and The Children’s Defense Fund have partnered to enroll eligible students in Medicaid, the state Children's Health Insurance Program (CHIP) and other health coverage with the goal of ensuring all children are in school and ready to learn, as well as enrolling undocumented children. The current focus is on Texas and California—two states with the largest number of uninsured children. 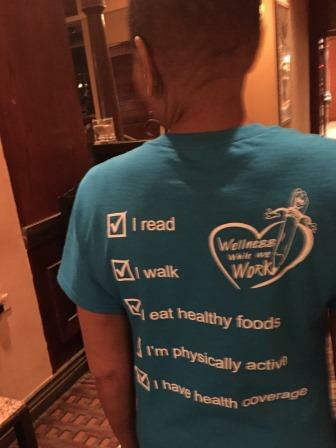 Sharon Adams Taylor(AASA) sporting t-shirt from Mountain View School District (Lillian Maldonado French, superintendent) on what it means to be healthy. Last line reads, "I have health coverage." On December 2, 2015, leaders from four school districts convened in California to discuss their role in health care coverage enrollment and outreach. 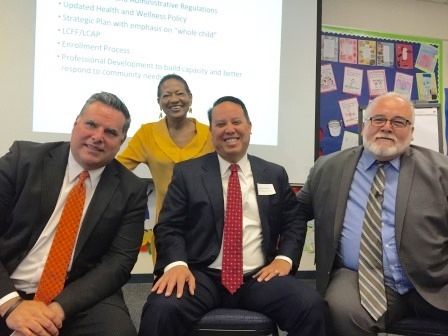 The California site visit featured a superintendent panel. Pictured from left to right Supt. Paul Gothold (Lynwood Unified School District), Sharon Adams-Taylor (AASA), Asst. Supt. Gudiel Crosswaithe (Lynwood Unified School District), and Martin Galindo (El Rancho School District). Schools have played a major role in reducing the amount of uninsured students in the United States—1 million more children were covered in 2014 than in 2013. In California, the state legislature passed Assembly Bill2706, which requires school districts to provide families information on health care coverage. The four school districts are models to other districts in California, on how to increase the participation rates in enrolling children in health coverage programs. 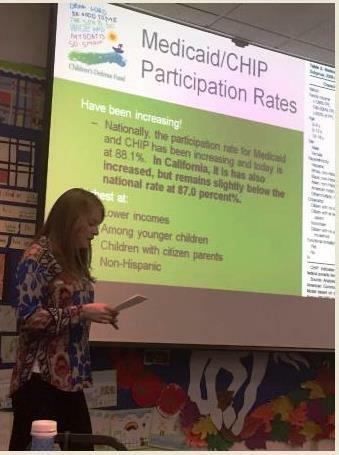 Kathleen King, Deputy Director of Health Policy, Children's Defense Fund presents the Medicaid/ CHIP participation rates.